When cooking a modern recipe with a dozen ingredients in a well stocked kitchen with a stove, eight pans, twenty spoons of various sizes, dozens of mixing bowls and every other convenience, I can’t help but look back to poor soldiers in the 18th century with only the simplest ingredients and a to cook them, a single pot. I am always on the lookout for simple recipes that would make that life barely livable. The substitution of simple flour for bread is a problem that come up in my thoughts. If you are handed flour instead of bread what do you do? Fire cakes is one answer, but an even better one might be hard dumplings. How simple can it get. Mix some flour with a little salt and some water. Roll the dough into balls the size of an egg (don’t ask me how big an 18th century turkey egg was, but I imagine it was a bit larger than a chickens egg) coat them in a bit more flour and boil them for 20 or 30 minutes. I made my dumplings a bit smaller than an imaginary turkey’s egg so I just boiled them 20 minutes. One of the easiest and probably most common ways for soldiers to cook the pound of meat they would be issued was boiling. This simple recipe would seem to be the perfect answer to using a flour ration. 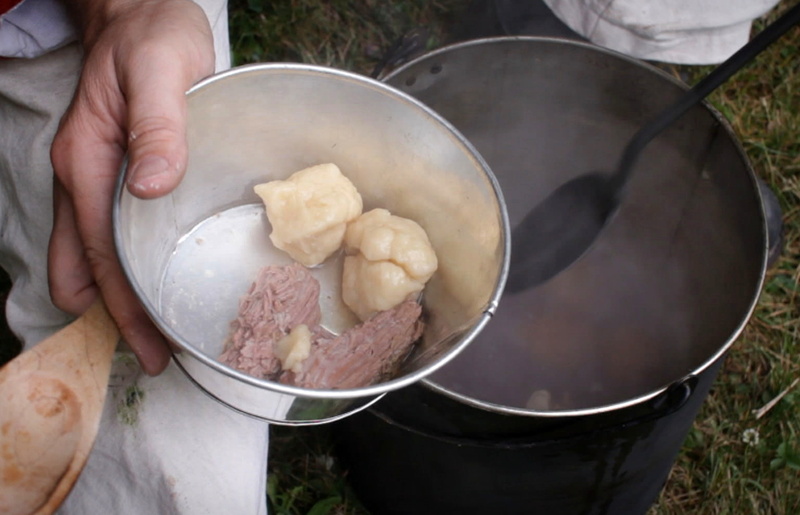 This entry was posted in 18th Century Cooking, Historic Cooking, Ingredients, Video and tagged boiled meat, dumplings, Hannah Glasse, rations, simple cooking, soldier cooking. Bookmark the permalink. I love this stuff! Keep up the good work, guys! By the way, the mushroom ketchup I got from you, is awesome on hamburgers. Interesting. I grew up with my grand mothers Hard dumplings which were one egg beaten, add 1/2 cup flour, mix till a paste, then add to soup. Boil till hard. Grand mother was first gen German from Prussia. I guess I was reenacting at an early age. That’s basically how I make my chicken and dumplings. It’s an old recipe passed down on my mother’s side. Flour, water or broth, some salt and pepper, mix it up and you roll them up. That’s all it takes to make really good chicken and dumplings. You don’t have to have a ton of ingredients to make something delicious. I enjoy all of these demonstrations. On this one, you are using white flour. Is that what the soldiers would get or would it be more of a darker whole wheat flour?